This is Gentle Giant’s limited edition Ahsoka Tano with Rotta Maquette based on the character as she appears in Star Wars: The Clone Wars . 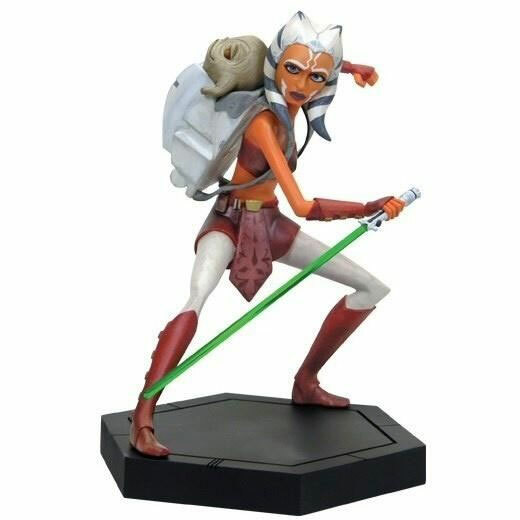 Ahsoka Tano is depicted by Gentle Giant Ltd poised to strike her opponents as she safeguards Rotta (Jabba’s son); tucked away in her backpack. Stands approximately 7.25 inches displayed on its base. Ahsoka Tano is assigned to be Anakin Skywalker’s Padawan. She graduated to Padawan at an early age, in part, as an effort by Master Yoda to teach her new Master, Anakin Skywalker, a greater sense of responsibility, but it was also necessitated by the Clone Wars. Regardless the reason for her advancement, Ahsoka remained eager, almost overly so, to prove herself worthy of her status as a Padawan.